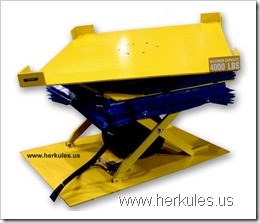 (10009) Herkules Equipment Corporation manufactures an extensive line of standard and custom Human Lifts to position workers at an optimum height for assembly and manufacturing operations. 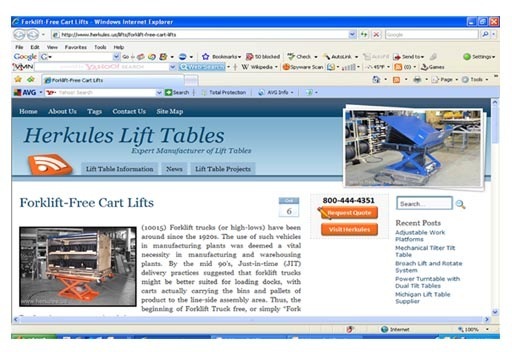 From small personnel lifts to long adjustable scissor lift platforms, Herkules designs and builds operator positioners to meet the exact needs for efficient and productive workflow. (10005) Herkules Equipment Corporation worked closely with United Space Alliance (USA) for the upcoming Ares I-X mission by customizing a lift system that enabled rocket engineers to securely load 2400 pound parachutes into a booster rocket. Herkules’ engineering team designed the lift system to meet all of USA’s unique specifications including raised height, travel, foot print, portability and all strict NASA safety standards with a 3 times safety factor. The lifts are currently used at the Kennedy Space Center in Cape Canaveral, Florida. 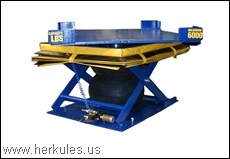 (10004) Herkules Equipment Corporation’s New Zero Level Lift and Tilt provides an easy method for loading material onto a lift table using a pallet jack. 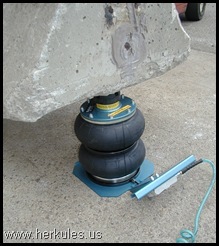 No need to wait for a fork lift or spend money on expensive floor excavation. The lift’s platform is only 3/8” lowered and the lift travels 25.5 inches. The tilt can be operated independently of the lift, positioning materials perfectly within the operator’s reach for better ergonomics.